It seems that most things I learn about horses, I learn in hindsight. It’s not a bad thing. Horses learn that way, too. When I was younger I had a great grasp of the little picture. And by that I mean the same way Wile E. Coyote had a fist around the Roadrunner’s long skinny throat…tight enough for a reality blackout–his own. I’m not saying I was no fun, but I also believed that patience was an excuse for procrastination. Type A people seemed lazy to me. Clearly it was going to take a horse to get my attention. 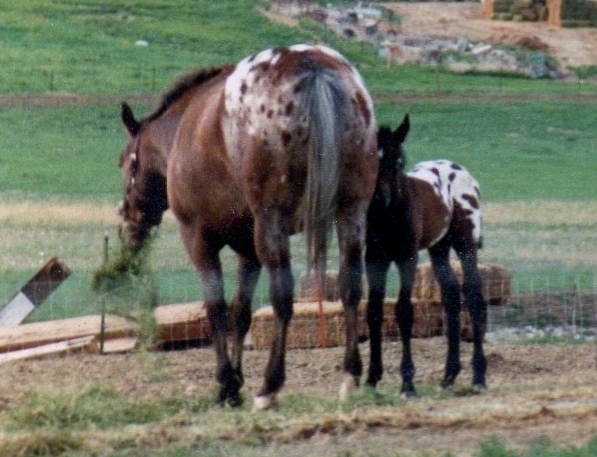 In a moment of divine intervention, an Appaloosa crossed my path–a weanling naturally. It was the perfect situation. If you’re not averse changing everything. I have a shoe-box theory of life. The short version is that the universe has perfect order and reason and love. Sometimes it doesn’t look that way because I live in a shoe-box and I can’t see over the top. If I was taller, I’d understand, but as it is, I can just do the best I can. Oh, and my shoe-box has a barn in it. The biggest thing that escaped my limited view, is that there’s always a continuum of change: there’s the horse you started with, the horse you have now, and the horse he eventually became. Change is a constant but what they don’t tell you, is that the largest changes won’t involve your horse at all. When is the best time to start a young horse? The disagreement starts early; studies say that growth plates don’t convert to bone for several years. Now some conservatives say wait to start a horse until they’re as old as six. It could feel like a waste for an impatient human but horses don’t believe in wasted time. Or time at all. On the other hand, the racing industry runs two-year-olds hard. And to spread the blame evenly, a few years ago at a nutrition seminar, most of the questions asked were about how to get Quarter horses ready to go as long yearlings. Horses live short lives and so we hurry. In the beginning my young gelding had many huge issues, and by that I mean, I had many huge shortcomings that I was very committed to. I’m not proud to say he paid for some of that–not that I blamed him. I blamed everything else instead. That’s how he knew I was a keeper. So I waited forever and started him at three. In hindsight, I wish I’d given him another year. It’s what I’ve done with every horse since him. With a little more mental maturity some of the issues can be avoided entirely. Years flew by and we hardly noticed. Then his tendon injury gave me time to question my chosen discipline; lots of reining horses retired early. It was the first time I heard the clock ticking, so I took the leap to dressage. In those days, competition dressage horses were elders, by comparison. That has changed some in the last twenty years, to the shame of contemporary dressage. Practiced properly, dressage can make a horse stronger and buy you more time. That was my new goal. At the same time, I was learning the art of consistency; to quietly ask for his best every day. It wasn’t hard for him. By then we were partners and our bickering was replaced by high-level negotiations. But it required more diplomacy and mental focus than I possessed. And physical control was a huge issue; my body, not his. Is there anything more beautiful than a horse in his prime with a rider who has figured out how to get out of his way? It feels like a shaft of golden light follows the two of you every stride. The line between horse and rider gets blurred and if you find a breath of focus so light and open, there are moments when it’s impossible to tell where the horse stops and the human starts. Oneness is a shabby, flat word for moments like those. There’s this sweet spot that we call a horse’s prime. It’s when they are at the height of their physical strength and mental ability; the intersection of fully developed muscles and confident minds, and if a rider happens upon this precious moment with an open heart, magic happens, but it’s elation combined with dread. It’s why we see professional riders always looking for new horses, even as they ride world-class horses. The work doesn’t necessarily destroy them but everyone knows the clock is ticking; that sweet spot is temporary. It isn’t’ going to last longer than any other flower of a moment. Blink and it’s over. Most horses start a slow decline but my gelding had an injury as definite as the flip of a light switch. I’ve been lucky, my Grandfather Horse survived, and now we’ve had as many retired years as we had riding years. It’s given me extra time for hindsight learning and the horses who have come after have all benefited. We owe him a debt, but it’s still bittersweet. Even now we want them to live longer. It’s unkind to force the work past that sweet spot and unkind to force the work before its time. The sad truth about my Grandfather Horse, now thirty, is that his physical prime was truly the shortest time of his life. There was no need to hurry to get there. In early years, blame was an issue…for me–horses aren’t nearly as attracted to it as humans. With my usual shoe-box hindsight, I had to acknowledge that our years of connection didn’t start when we got it right. My loud thoughts had made a racket inside his head from the beginning. We shared a shoe-box; of course my horse felt those dark feelings. Better to give up blame entirely. With all that extra room, forgiveness could stretch out and brighten the place up. If I had it to do over again, on day one I’d start by forgiving him for having a shorter life. Those were the good old days already. Beautifully written Anna! The question of when to start horses is a discussion I’d rather avoid, when talking to other horse people. There’s usually a lot of guilt connected with it. I’m in the process of bringing home two, 5 year old, rescue horses, next week. They have lived their whole life on a pasture, without training. I am thrilled to getting to know them. I already know that one of them is most likely going to be very easy to start under saddle, while the other one….I have no idea what’s going to happen with her (my favorite..of course.) That’s horses, bringing magic to our lives. Some for a moment, and some for many years. I love reading your posts! What an amazing opportunity you have… what a precious time. Best of luck. Thank you! I feel the same way. Horses are truly the best teachers. Thank you! And he was blessed where accidents were concerned as well. Good for the both of you. Thank you for this heartfelt comment. I think ‘boot box’ is a compliment, thank you! This is lovely, I think. Starting horses too early has always been a pet-peeve of mine, akin to child abuse. It is a hard start all right. I agree, Melinda. Thank you. Oh Lisa. You are so eloquent. I miss him too. My sad condolences, even as I know you are rich in your memory of him. Thank you for sharing that with us. I know exactly how you feel. My grandfather horse left this realm in Dec. of 2009 just short of his 28th birthday and I miss him to this day. I had him since the day he was born and only twice in his life was he ridden by anyone else and those were short jaunts. He thought I could save him from anything and would literally try to hide behind me when he was nervous. He loved to give my arms a serious wash. I miss the total knowing of each other, no surprises and the daily woes just fell away. Mostly, because he was out of my father’s mare, technically my dad’s horse, (my dad gave him to me on the day he was born) losing him was like losing the last physical connection to my dad. (Dad died in 2004.) My consolation is that, if heaven is everything you love then the two of them are up there together. Maybe the best description of heaven I’ve heard, thank you for this heartfelt sharing. paying for my decisions. You always manage to make me cry with your truths that are also mine. Then there is still time, and no worries, forgiveness abounds. Thank you for your honest comment. We get that from horses, too. Hindsight has been my best – and cruelest – teacher. Hudson will be 27 in a few weeks. I’m trying to balance my need to encase him in bubble wrap with his need to WORK. Everyone has an opinion, and I need to remember his is the most important. He’s recovered from his encounter with gravity. Two bad knees, a bad hip, and absolute refusal to limp. The hope in his eyes when he sees a bridle, or hears a rope whistle in the air… I choose to listen to his emotional need, and give him light work ponying safe horses. He’s The Boss. Time is ticking along, and I try not to listen to dread. He isn’t. He’s hopeful, joyful, bossy, and impatient with me trying to protect him. Great post! Thanks, Jane. My boy was the same, the day I became a quitter (at his last injury) he hated me. It hurt. I trust you’ll delay that day for Hudson as long as it’s fair. You don’t want to see his retirement face!! I always love your perceptive comments. I am new to your blog Anna, your wisdom and writing flair are something I look forward to. Thank you for sharing your thoughts, I love to read and share them . Welcome, Kim, and thank you. I appreciate some of your reading time. I really enjoy receiving your posts. When I was young I loved riding and being with horses so much. Now that I’m old, your writing brings back those tender and joyful years of connecting with such magnificent hearts and souls. Bless you for sharing your practice with me. Barbara, thank you and you are welcome to ride with us any time. I appreciate your kind words. Lovely – lovely! So many of your posts bring tears to my eyes – thinking back about my boy – how, when he didn’t feel good, he would walk right into me and push his head against me. He did that the night before he was put down. I do hope your Grandfather horse had many more years ahead. Really disagree with starting colts so early. I remember the hunter/jumper trainer at the barn where I boarded – didn’t start any of hers till they were four, and very light riding on the flat for quite some time. Makes me cringe when I see these 2 year old babies on the track. Sorry – HAS many more years ahead! ( my brain knows what I’m thinking, but apparently theres a disconnect from that to my fingers)! Thanks, Maggie. We always appreciate your kind thoughts. Thanks, Sue. I work at it, and appreciate the kind words! This was timely, having just watched the Kentucky Derby (through my fingers hoping not to see anyone go down), I have to agree about starting the youngsters too early. If only we’d learn that we’d have the grace of their company longer if we just started them later.